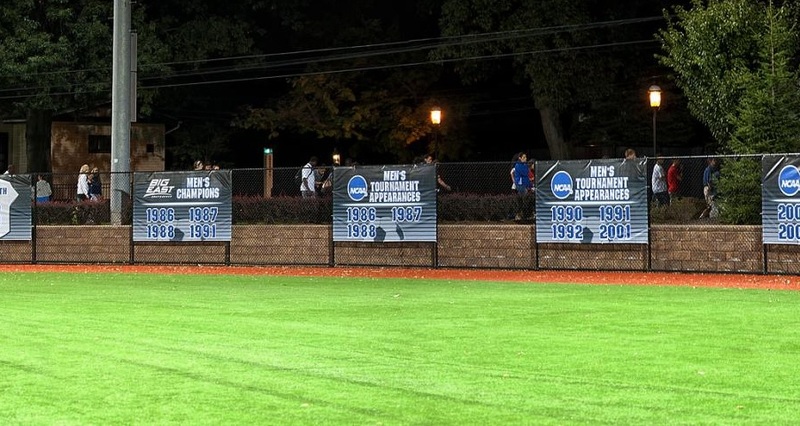 What makes a soccer banner memorable? Soccer is a team sport played with a spherical ball between two teams of eleven players. It is played by 250 million players in over 200 countries and dependencies, making it the world’s most popular sport. The game is played on a rectangular field called a pitch with a goal at each end. The object of the game is to score by moving the ball beyond the goal line into the opposing goal. The word “soccer,” which is believed to have originated in Britain some 200 years ago, comes from the official name of the sport, “association football.” As other versions of the game evolved to include Rugby Football, it is believed the Brits adopted colloquialisms to distinguish each game. Ever since the game soccer was introduced, it has been played by millions of players around the world and soccer banners have been used since time immemorial. Team banner plays an important role in the success of every soccer players, they act as a memorabilia once the game season is over. They don’t just act as decoration or a way to show your support to the team but most players keep a piece of their banner as keepsake. My quest for Alaska brought me to the Sporting Woman and led to wonder. Christopher and I spent 40 days in Alaska this past August and September celebrating his 40th birthday. Wanting the trip to be a gift, I needed a job. So, last December 19th Christopher unwrapped his birthday gifts opening a travel book on Alaska with my first The Sporting Woman paycheck inserted as a bookmark. We spent the next eight months preparing for Alaska. Our itinerary began with a 5-day sea kayak trip in the Northwestern Fjord followed by a two-week backpack trip in Wrangell/St. Elias National Park wilderness. Having never camped for longer than three nights, three weeks of camping felt like both a physical and a mental challenge. We learned to kayak and stepped up our hiking mileage. I started reading Mardy Murie’s Two in the Far North. Christopher began Peter Jenkins’ Looking for Alaska. My fully loaded pack became my summer companion inviting comments when walking to work like, “hey, lady go to the mountains”! My discovery – preparation does not necessarily make you prepared. Neither the training miles and weight, the reading, the planning, nor the gear can prepare you for a unique unknown. I knew what hiking 8 miles with a full pack feels like, I did not know what an 8-mile trek with a full pack in muskeg and tussock country would feel like. I knew to expect extreme weather yet was not prepared for the indifferent, harsh reality of never-ending sleet and freezing rain. The Colorado Rockies could not prepare me for the majestic scale and glacial grandeur of the rugged St. Elias range. My knowledge of Colorado tundra did not prepare me for the fragility and the intensity of the arctic tundra. Likewise, I was unprepared for the raw, forceful, primeval, mesmerizing sound of a calving tidal glacier. Striving to be prepared, I ironically relished my lack of preparation. For isn’t that, at some level, the point. How can you truly and fully anticipate what you have yet to experience? In choosing the Alaska landscape, we sought fresh, unknown territory. Our trip embraced adventure and discovery. And now, back at work, I look at each of you as you share your stories about training to run your first marathon, to participate in your first snowshoe outing, to hike your first fourteen-er, or to go to your first yoga class, with a renewed sense of appreciation for your commitment to experience something new and different. And I hope that you, like me, encounter unanticipated surprise, joy, and wonder along the way! Recently, a physical therapist told me that the back problems I’ve been experiencing for the last year are the result of eleven years of running, and that giving up running is probably the only way to heal my back. Within minutes I wondered: “What will happen to my body? Will I get fat? Out of shape? Lose all control and self discipline?” I wasn’t sure which was scarier to me – the loss of running or the feelings that surfaced about my body and food. It is tempting to think of “eating disorders” as those psychological problems that other people experience or as a clinical set of definitions that include daily bingeing, purging, starving, weighing, and swallowing laxatives to the point of organ damage. But as with many things in life, the extremes tend to grab our attention, and we miss what is right in front of us. For instance, the uncomfortable relationship between body image, weight, and self esteem that plagues so many women in this country that it almost becomes the norm. I was always a tall, skinny kid. I watched television, read magazines, and saw movies that gave me a consistent message about being a girl: be pretty, do everything you can to please other people, and above all… be thin. I knew I was supposed to be worried about my weight long before I ever was. But as I tried to deal with typical adolescent and teenage feelings of being overwhelmed and out of control, I learned to control the one thing that I could – what I ate or didn’t eat. The more I restricted the food I ate and the less I weighed, the more powerful and in control I felt. After several months of eating only a section of orange, a hard boiled egg, and a few bites of dinner each day, I passed out during a volleyball game. Scared, I started eating more and thought that this strange eating behavior was behind me. But over the following years I often used eating, or not eating, to drown out overwhelming feelings. At age 24 I started seriously exercising and I realized that working out was a great way to control my body as well. It also seemed much healthier than starving or eating everything in sight and then throwing up. The worst “clinical” symptom I ever faced was the loss of my period for several months while I was bingeing and purging daily. I would awaken each morning terrified of what I would eat and then have to exercise off later that day. The emotional toll was astounding. I believed that only my “outsides” mattered. As a feminist, I knew that the images of female bodies I saw all around me were unrealistic and sexist, and yet my behavior was playing right into that image. I was deeply ashamed to be engaging in behavior that I so clearly understood was destructive and dangerous. It took so much energy to hide what I was doing that I had none left over for anything else. When the pain of all this obsession with eating and not eating got to be too great, I had to admit that I needed help. Admitting to other people what I was doing was the hardest but most important thing I’d ever done. I learned that being smart doesn’t make you immune from powerful societal messages. I learned that eating too much or not enough was a great way to avoid dealing with feelings that I didn’t think I could manage, but that when I was done, the feelings were still there. I learned that I was addicted to food and exercise and used them as a way to make myself both disappear and be noticed. As I started to understand all of these things, the obsession slowly went away, but it never disappeared altogether. Fast forward to the physical therapist’s office. As discouraging as it was to me that one of my first reactions to this news was fear, I also know now that this is an old, learned reaction. This is a part of me that I try to accept rather than make disappear. I have learned to eat and exercise in a way that nourishes and strengthens my body but feeds my soul as well. And I’m still learning. BUNIONS – Not Just for Grandma Anymore! We have all heard horror stories about Great Grandma Wilson and her bunions. They were horrible, ugly, disfiguring and she was hobbled by the time she was 50. But if someone asks us “what is a bunion”, we’re hard pressed to provide an answer. Here’s the scoop. Have you ever seen anyone who has a bump on the side of the big toe joint? If the answer is yes, then you have seen a bunion. Sometimes it is a small bump and other times the bump is accompanied by the big toe drifting under the lesser toes. Often times a bunion is thought of as a growth on the side of the foot and removing the growth would solve the problem. Like most things, it is not that simple. Typically, a bunion deformity is the result of the first metatarsal bone (long bones of the foot) drifting away from the lesser metatarsals. The bump is actually the joint sitting in an abnormal position. Several things contribute to bunions but only occasionally is it the result of wearing high heels or pointed shoes. Typically we inherit the predisposition to develop bunions. Arthritic conditions, injuries, neuromuscular diseases or lower extremity structural problems may also result in the development of bunions. So, how do we treat it? Unfortunately, there are no braces, splints or exercises that will coax the bone back into position. Orthotics may slow the progression but has not proven to stop it. If someone has had symptoms for a short time or the pain began with a specific shoe or activity, I usually recommend anti-inflammatory medications, steroid injections and/or avoidance of the shoe culprit. Occasionally, bunion shields or pads will relieve the pressure, allowing the symptoms to subside. If conservative measures fail, surgery is indicated. There are several different procedures and the choice depends on the severity of the bunion and the presence or absence of arthritis. Usually, bunion surgery requires fracturing and resetting the first metatarsal bone and can take from 6-12 weeks to heal. This surgery is usually very successful but should only be performed on people who are having pain that affects their ability to work or play on a consistent basis. Poor cosmetic appearance or occasional pain are usually insufficient reasons to recommend surgical intervention. Young women often ask me “shouldn’t I have it fixed now so that I won’t have problems later?” That is a difficult question. The answer is usually, but not always, no. Bunions are a progressive deformity but we cannot predict the rate at which they will worsen. If you have these questions, have your foot evaluated by your podiatrist and discuss your options. I don’t believe the popularity of yoga comes as much of a surprise to any of us. It is a practice that has yielded centered results for millennia. Of course, the introduction of aerobics to the age-old notion may be something uniquely American. That it becomes something of a new religion should not be surprising. I believe we look to these things when we begin to feel something missing. It is an especially important time to take stock as we head to the year-end. For many of us, the things we have held constant for years have begun to shift. Our economy teeters. Retirement accounts that seemed like unbreakable nest eggs have fallen to earth with a deafening crash. Our sense of well being as a community has been shaken to its core and a redefinition of our priorities has caused us both concern and celebration. Perhaps this is an opportunity for our core values to increase at a time when it would seem that the value of most things previously held dear declines. This inverse relationship comes as no accident. As we become more mindful of the parts of our life that hold the most meaning, the currency of what we thought we needed becomes less dear. As we stretch beyond what seems reasonable, we are able to ascertain the value of what lies beyond what we thought necessary. Increasing the blood flow to our most inner workings assigns a value and belief in their strength and grace, attributes that will carry us into the future. It really is simple, just not easy, to begin to let go of our complexities. As we inhale and exhale, a natural rhythm is restored. It is a peace we may need going forward in a time when events of the world catapult us into a place we have visited before and had hoped not to return. I urge you to take a deep breath. We must look to ourselves to discover what will make a difference when everything seems the same. The Sporting Woman Community Fund has grown from many requests over the years to help fund or provide material support for the many endeavors that women have chosen to enrich their lives. We want to help women and girls who want to get out and do something athletic, stretching themselves beyond what they ever believed possible. The Sporting Woman Community Fund will be accessible to women and girls of all abilities and to dreamers, big and small. The mission of The Sporting Woman Community Fund is to provide financial support to women and girls who identify as disadvantaged and/or who have a desire to further themselves through amateur national or international athletic competition. Through this support, individuals and groups will be able to participate in life changing experiences through athletic endeavors. How do I apply for funding? Complete the attached application form, email or mail it to us, and we will have an answer for you within three months of the date of your application. We will also consider emergency requests on an as needed basis. Who may apply? Any female who is a permanent resident of Colorado. How can I contribute? Please make your checks payable to The Sporting Woman Community Fund and we will put your contribution to work. Is my contribution tax deductible? Our federal tax id number is 71-0914265. The Fund has been established as a non-profit corporation in the State of Colorado. We are a 501(c)3 non-profit.